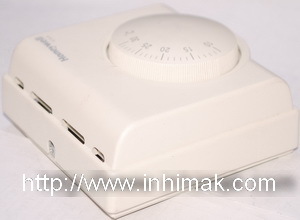 Room Thermostat T6360 Price in Pakistan - Cheap Rate of Room Thermostat T6360 Islamabad, Rawalpindi, Lahore, Karachi, Pakistan. 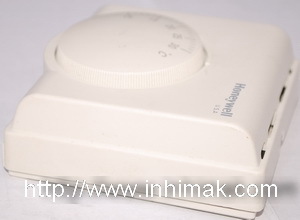 | Inhimak Inc.
A T6360 room thermostat device controls the room temperature automatically where installed cooling or heating/cooling systems and provides ON/OFF control for circulation pumps, relays, zone and gas valves in cooling or heating/cooling and changeover switch. 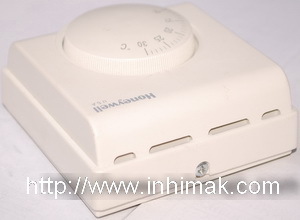 A room thermostat can be used in public places like hospitals, schools, waiting lounges and reception. 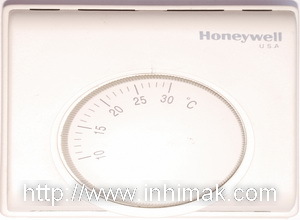 A T6360 is useful and reliable product of Honeywell USA. 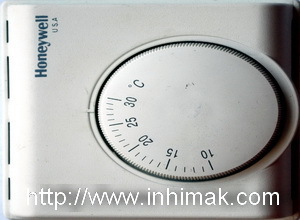 Sensing Element:- The thermostat sensing element comprises two circular, flexible metal plates welded together at the rims encapsulating a small quantity of gas (0.125g) in liquid form, whose pressure changes greatly in response to small variations in temperature. 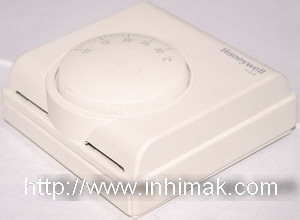 In effect, this dual diaphragm forms a bellows which expands/contracts in sympathy with the ambient temperature changes - this movement serving to operate a snap acting switch rated to control the heating or cooling circuit.